A murder, a missing body, and a long forgotten history. Is anyone really ready for by Frolick Theatre playing at the Frolick Studio Theatre? This is an interactive haunted house that thrives on its theatrical roots—a fun little romp with a few creative extras thrown in. I went alone, but ended up with one other solo guest and a family and it really made me realize just how different it is being with other people in the environment. There’s something about everyone getting in on the game that made it more vibrant. The whole thing is geared for groups of people instead of one or two. In my opinion I always find it a lot more fun and interesting when complete strangers start getting in on the act. 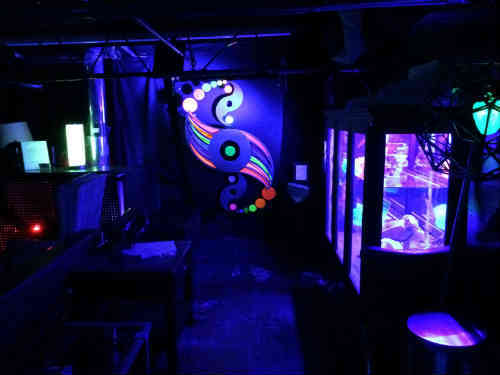 The haunted house portion of the evening is interactive, as you search for clues to the fate of the local ghost using black lights to read hidden messages on the wall or search drawers for items. While that’s the main adventure, it’s hardly the end of the evening depending on what time you go. What’s nice about a haunted house that’s so much smaller and less scare-driven is its personable, one-on-one atmosphere. You’re not going to get this at larger theme parks like Halloween Haunt or Screemers. Here you get a magic show, tarot readings, live music and movies later in the evening. It’s more like a small halloween-themed fair or party that changes slightly week by week. Is it a perfect experience? I had fun, sure. But I definitely felt like it was built with families—and teenagers in particular—in mind. Then again, I wouldn’t be surprised if they tweaked the stories according to their audience. The actors are all very keen to interact with people and just embrace what they’ve built. And trust me, when they say interactive, it also means you better be ready to participate. You will be fighting with noodles and helping bury bodies in graves. Be prepared to get a little blood on your hands. If there’s one bit of advice I’d offer, it might be to try a later show. I went early and there was virtually no one there. I suspect that the later tours are much more popular and based on what you pay for, it makes you more likely to stick around for the other activities. And that’s actually a good thing. Think about it as a community experience, a chance to meet artists, hang out, watch a show and listen to some music. While you might not find frights abundant at Frolick in the Face of Death you’ll definitely get into the Halloween spirit. I’d go check it out. Shows run Wednesday to Sunday (except October 21st), 6pm-10pm. Each tour starts on the hour.